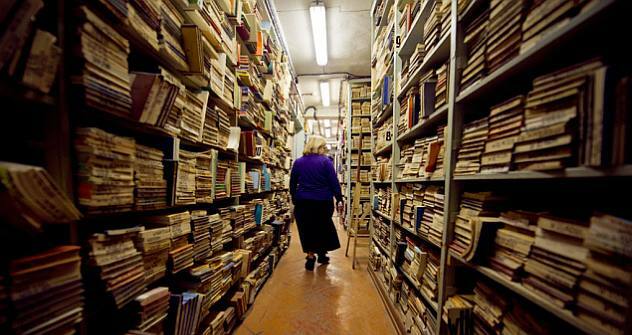 While preparing for a massive renovation of its 100-year-old facility, librarians at the Russian State Polytechnical Museum found more than 30,000 pre-revolutionary books and magazines. A treasure trove of pre-revolutionary books and magazines has been discovered in the archives of the Russian State Polytechnical Museum Library in Moscow. The museum librarians were preparing the collection for a move to a temporary depository when a small hiding place stacked with books was uncovered; the building that has been the library’s home for more than 100 years is scheduled for a much-needed renovation. The issues with the facility were not only age-related. “The layout of the room is not suitable for keeping books, and racks were set up chaotically. When they needed more storage space, they simply placed a new rack wherever possible,” said Svetlana Kukhtevich, deputy director of the Polytechnic Library. The library of the Polytechnical Museum was established in 1871, prior to the museum itself, and was created through donations by members of the Society of Natural History Enthusiasts, including professors from Moscow University whose names are among the most famous in Russian science – Dmitri Mendeleev, Alexander Butlerov, Ilya Mechnikov, Ivan Sechenov and Kliment Timiryazev. The library was replenished through exchanges with the Paris Natural History Museum and the Royal Society of Edinburgh. During the Soviet era, the library was part of the Education Commissariat. It arranged exhibitions displaying the country’s technical advancements, from “Popular-science literature in agriculture” to “Lighting engineering.” The library was required to receive a free copy of every work in the natural sciences and technology published in Russia. As the books were packed into boxes, the empty racks were dismantled. Behind one of these racks, the librarians found a plywood wall that sounded hollow when tapped. “We moved the cover aside and found books behind it. When we removed the wall completely, we saw piles of books stacked up to the ceiling.” said Kukhtevich. According to preliminary estimates, the 6.5-foot-long hiding place contained about 30,000 books printed before the 1917 Russian Revolution. The books are almost exclusively in foreign languages, including French, German, Latin and Greek. “All scientists and generally educated people of the 19th century spoke several languages and there was no need to publish books in Russian,” said Kukhtevich. While most of the books were published in the late 19th and early 20th centuries, the oldest book in the collection, “Description of Picturesque Areas Occupied by Germany,” was published in 1706. Other books have “remove the mark” followed by a torn page where a label used to be. One interesting book in Russian is “Production Facilities of Russia,” which lists all the factories across all industries. “When you read this book, you understand that the country was prospering and we were even more advanced than some western nations,” said chief librarian Olga Pleshkova. One history textbook, published in 1906, features doodles by its owner – a second-year student named Sergei Chelnokov. According to the pattern of the markings, Chelnokov had the habit of beginning each lecture taking notes before boredom drove him to draw illustrations. Following the initial discovery, librarians located another plywood wall in the library, broke it down and found two more niches filled with foreign periodicals from the 19th century – magazines on the history of science and technology, art and architecture. “Now we can not only replenish our collection of periodicals but also replace worn out magazines with copies of them discovered in the cache,” said Kukhtevich. One collection features nearly all the issues of the British magazine Engineering from 1884-1894. This is an important find not only for bibliographers, but also for researchers in the history of technology. This collection originated with the library itself – foreign technical periodicals were delivered to Russia exclusively via the Polytechnical Library. It is unclear why the books were hidden. There is no evidence that anyone ever demanded that they be destroyed. One possibility is that museum workers decided to hide them simply out of fear. “We had an idea that there was a cache with books somewhere in the library but we didn’t know exactly where. The previous director worked here for 30 years and never found anything,” Kukhtevich said.